Chic on a Shoestring Decorating: Earn $100 by opening a new checking account! Act fast, end the 3rd! 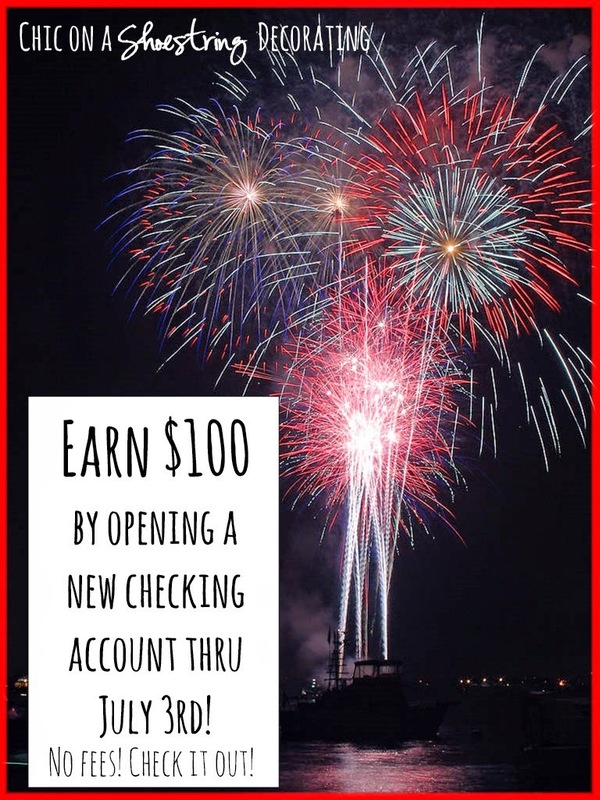 Earn $100 by opening a new checking account! Act fast, end the 3rd! I want to share a deal for you to earn some cash today. Capitol One 360 is offering $100 for new customers who open a checking account with them between June 30 and July 3rd! Plus, this is a free checking account, there are NO FEES! Click here to open your account now! I am a customer and they are not paying me for this blog post. I started a free checking account with them several years ago when they were ING. I opened a checking account that I could keep separate from our joint checking account for any online transactions I make. I don't keep much money in it but I feel like having this separate account keeps my everyday checking account separate and "safer" since it's not hooked up to any online things. I have been so happy with this Capitol One 360 account that is completely online. I was leery of having a bank with no branch in town but it's been easy peasy. My favorite thing about it is that I can easily deposit checks into my account with my camera on my smart phone app (this is awesome!) Plus, there are plenty of ATMs in town that don't charge a fee for me to use. I can also use my Capital One 360 debit card just like a credit card anywhere that takes credit cards. Are you paying your bank fees just to have a checking account? Do you buy things online? Do you use Paypal, Etsy, or Ebay? I highly recommend getting a Capitol One 360 checking account for additional piece of mind and no fees! Click here to open your account and earn $100 bucks! Click here to open your account and earn $100 bucks! Disclosure: I was not paid to write this blog post and Capitol One 360 did not sponsor me. I am their customer and all opinions are 100% mine! This post does include affiliate links. See my full disclosure here. Oh man, if i didn't have a checking account already, I would totally open one to get some free money. I am sort of cheap, so I probably would open an account for only receiving $10. Maybe I should open an account somewhere?